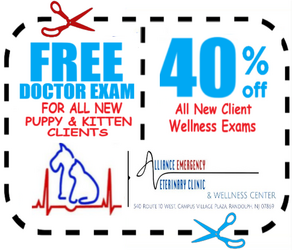 Alliance Emergency Animal Clinic and Wellness Center prides ourselves with searching for new ways to care for your pet, especially where pain is involved. Veterinary laser therapy provides a non-invasive, PAIN-FREE, SURGERY-FREE and DRUG-FREE treatment that is used to treat a variety of conditions and can be performed together with existing treatments. More specifically, the laser stimulates a chemical reaction known as photo biostimulation which utilizes the regenerative properties of light. It releases endorphins in your pet which promotes faster healing and helps your pet feel better. In simple terms, your pet can feel immediate relief. Additionally, each therapy session lasts only a few minutes. As each pet is different, we have a protocol that ensures your pet’s individual safety. During each session, your pet will wear eye protection and so will everyone else in the room. Your veterinary professional aims the laser at the specific area(s) of treatment which result in your pet feeling the warm heat that is generated from it. Since this feels similar to a massage, most pets become very relaxed and enjoy the therapy process. Some may even fall asleep! Unbelievably, many pet parents haven't heard of this safe, non-invasive procedure even though it’s been used on humans for over 40 years! Consult with your veterinarian to determine if laser therapy treatment is right for your pet. If your pet exhibits any of the classic signs of pain, we recommend booking an appointment with our clinic right away to determine the cause and the plan of treatment. Most patients see positive results in one to three treatments. Acute conditions can subside with as few as one set of treatments. Chronic conditions can be managed with regular monthly treatments. There are no known negative side effects.